Haulmark Transport - the name in Enclosed Cargo Trailers. Steel framing, 3/4" plywood flooring, heavy-duty hinges, and structural gauge steel frames. Haulmark takes the Transport seriously... we know it works, and know when you work, you can count on it to be there for you... every mile of the way. When its not just a hobby... remember the Transport - with over 100,000 on the highway, it is a name that needs no introduction. You work hard and you believe in doing the job, any job, the right way. From moving your friends into their new home to storing your favorite hobby gear or carefully transporting your family’s antique heirlooms, you need a smart cargo trailer to help with all your hauling needs. Your expectations are simple. 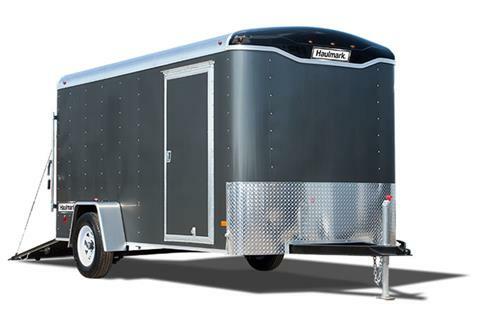 Your trailer has to be built solid — durable and dependable for years to come. Your trailer has to be the appropriate size, proper capacity, equipped with the right features and competitively priced. You don’t want the cheapest trailer, but you do want the best value for your dollar. At Haulmark, we build trailers that work as hard as you do. Body - 14 ft. 9 in. Average payload - 1,580 lb.